Organic tomatoes richer in vitamins? Despite various claims to the contrary, a new report suggests that organic food may actually be healthier than the conventionally-grown alternatives. According to latest research, organic tomatoes contain higher amounts of vitamin C and vital compounds that can help to battle a range of diseases, even though they actually tend to be smaller. Writing in the online journal Public Library of Science ONE, scientists from the Federal University of Ceara said that this was most likely due to the fact that organic plants face a tougher upbringing than their counterparts. It is believed that the stress they undergo in not growing with the help of pesticides and artificial fertilisers encourages them to produce more of the healthy chemicals in their fruits. 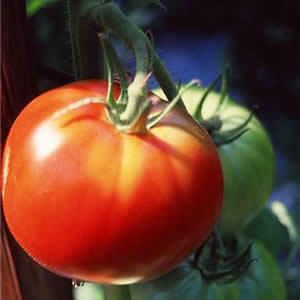 Tomatoes grown on conventional and organic farms in Brazil were compared for the current study. The farms were located close to one another to ensure that environmental differences were kept to an absolute minimum. They found that organic tomatoes were 40 per cent smaller than the others but contained 57 per cent higher concentrations of vitamin C, as well as more than twice the levels of plant phenols when ripe. Phenols are responsible for many of the health-giving properties of fruit and vegetables. Lead researcher Dr Maria Raquel Miranda said: "Taken together, our observations suggest that tomato fruits from organic farming experienced stressing conditions that resulted in oxidative stress and the accumulation of higher concentrations of soluble solids as sugars and other compounds contributing to fruit nutritional quality such as vitamin C and phenolic compounds." They also suggested that the findings have implications for all types of farming and not just organic. Often, growers will do their utmost to reduce stresses on plants in order to maximize yield and fruit size, however the team suggested that it may actually be better to allow for some levels of stress to improve the fruit quality. The relative health merits of organic foods have caused something of a split in opinions. Last year, a review from the US suggested that fruits and vegetables grown organically taste better but offer no higher nutritional value. However, the Soil Association rejected this, stating that organic farming is better for health and the environment. It’s an ongoing debate, however, taking into account the positive benefits to the environment as well as reducing the toxic load on our bodies, organic foods still pose a much healthier option.